Richard Amos Sensei will be visiting our dojo again December 8-10 to teach seminars and administer a dan (black belt) exam. Amos Sensei is Chief Instructor for the World Traditional Karate Organization. 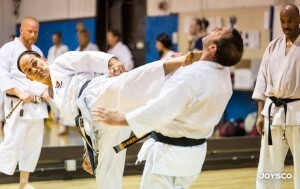 He spent many years honing his skills in Japan, including in the exclusive JKA Instructors’ Course. He is an amazing technician who exemplifies the highest standards of Shotokan karate. Seminars will take place Friday evening, Saturday morning and afternoon and Sunday morning, with the exam following the Sunday morning seminar set. All Friday & Saturday seminars to take place in our main dojo at Cubberley Community Center, in Palo Alto. Sundays seminars & exam will take place at De Anza College, in Cupertino (room PE15 is near the pool). Seminar 1 – 7:00-8:15pm: all levels, 13 years and older. Seminar 2 – 8:15-9:00pm: brown- & black-belts, minimum 15 years old. Seminar 3 – 8:00-9:15am: all levels, 13 years and older. Seminar 4 – 9:15-10:00am: brown- & black-belts, minimum 15 years old. Seminar 5 – 2:00-3:15pm: all levels, 13 years and older. Seminar 6 – 3:15-4:00pm: brown- & black-belts, minimum 15 years old. Seminar 7 – 9:00-10:15am: all levels, 13 years and older. Seminar 8 – 10:15-11:00am: brown- & black-belts, minimum 15 years old. Discount for full-time students: $5 off total if attending 2-3 seminars; $10 off if attending 4 or more. Discount for WTKO members: $5 off total if attending 2-3 seminars; $10 off if attending 4 or more. Payment must be received by December 3 to take advantage of pre-payment discounts. Please send payment to Silicon Valley Karate, 4000 Middlefield Rd., unit G7, Palo Alto, CA, 94303. Those wishing to take the dan exam should consult with Keeling Sensei.